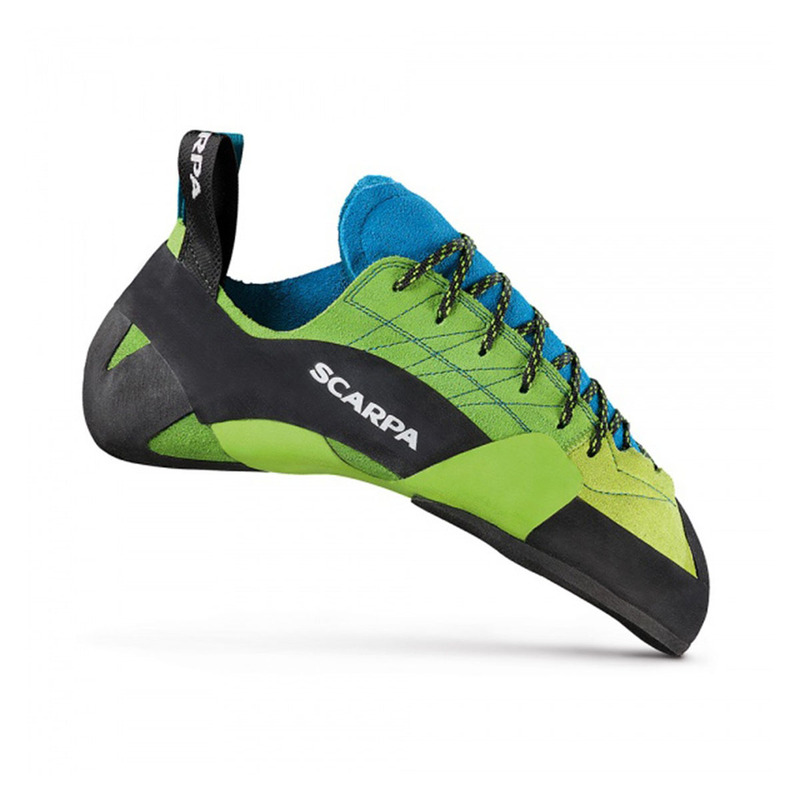 Everything about the Scarpa Mago Power is designed to drive power through the big toes. If you're looking for an aggressive climbing shoe, with high downturn and asymmetry, that will stick to and push off extremely small holds, the Mago Power will provide the absolute best in sensitivity and precision. The Mago is really a shoe that's built from the toe area up. The shoe's upper is a 5-panel design with a seamless big toe panel and seamless four toe panel. This seamless design of the tow-box makes sure that the material moulds to your foot perfectly for the maximum amount of evenly distributed power possible. A thermoshapable insert called the TPS (Toe Power Support) is placed under the forefoot which supports the toes when pushing down hard, improves pulling capabilities, and enhances precision. And there's an X-TENSION active rand that adapts to your foot shape when your stood on a hold, essentially storing power when your stationary then releasing it when you push off. Just an amazing shoes. real pies of shoes art. Precision, accurate, intense, solid texture and rubber grip! Amazing feeling on a small pockets and edges! Highly recommended for everyone to work on Sport projects or single trad routes! New Era here I come! After wearing scarpa instincts, chimera, and the furia s; the Magos was my next shoe i wanted to try. I started using them in the gym. The amount of power i can push down through the big toe is unbelievable. This is definitely a stiffer shoe compared to the shoes i mentioned. The only downfall of the MAGO is that theres not enough rubber on top for toe hooks. When you compare the amount of rubber that is on the toe box of the MAGOS to furia s, chimera, instinct. it is nowhere close to enough. I kept slipping off problems that relyed on toe hooks. Other than that, the shoe is definitely great for driving power down and the laces fitment of the shoe hugs the foot perfectly. Wish there was more rubber on top.